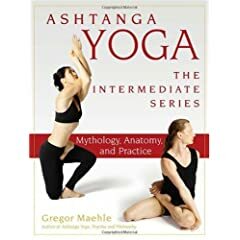 I liked Gregor Maehle’s second book Ashtanga Yoga The Intermediate Series a whole lot. I had liked his first book too and even wrote a review on it, but it must have been in my old blog, which unfortunately no longer exists. The shala is offering free classes on yoga theory and they come with the booklet “The Yoga Sutra Workbook” from the American Sanskrit Institute. They are open and free. Next one is this Sunday from 5 to 6 at the Ganesh Temple. Reading “Science of Breath ” I find myself noticing the nostril through which air is coming in, how long are the inhalations, how long the exhalations, how is my posture. I never really think about these things, and all of a sudden they come to the center of my awareness, and then, just like that, my awareness is gone, I fall into unconsciousness thinking about work, or that email I have to write for the performance contract, or the long-distance conversation I had with my father which I did not particularly enjoy. I finally got the book on the course in miracles. I have been reading Marianne Williamson and I like her work, but I wanted to go to the source of it all. The book is packed with little phrases that can be meaningful and require lots of thinking, so I was only able to read a little, but the interesting thing is that it has a workbook where it provides you with 365 exercises to be done throughout a whole year, so you actually learn to apply the principles of the course.